Portugal. The Man. rocked the Boom Stage Sunday. 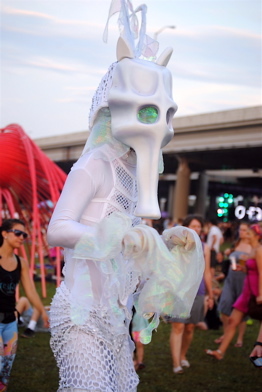 The Forecastle music festival returned to Louisville July 17-19 with its Kentucky-centric take on the outdoor summer music gathering. This is the premier live music event in Kentucky, catering particularly to the alternative music format, but included a healthy dose of pop, hip hop and electronica. While music is the central theme uniting this event, the drinking component continues to raise its profile as an experience worthy of its own attendance, and certainly helps bind the different musical tribes into one shared experience. Usually I attend this event for my own pleasure, but this year I was working it for the Kentucky Health Benefit Exchange. 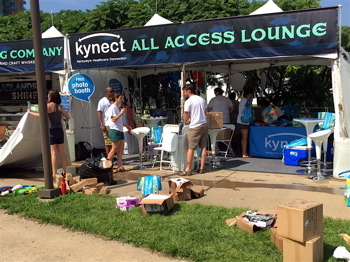 kynect, Kentucky’s local brand of Obamacare, was a Forecastle sponsor, and hosted an All Access Lounge on the festival grounds. 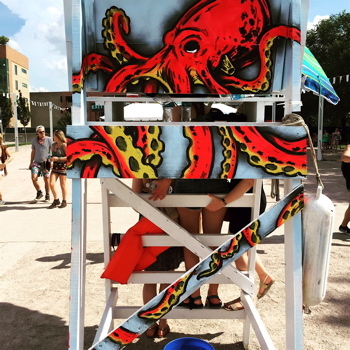 Attendees could re-charge their phones at a digital re-charging station, apply complimentary sunscreen or bug spray, pick-up a mini-first aid kit, and win several fun giveaways like fanny packs, mood bracelets, cell phone wallets and light-up bracelets. 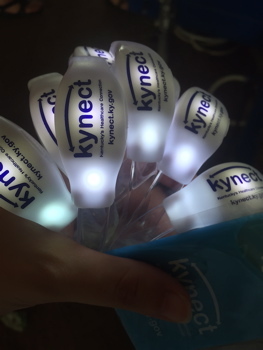 Some might question why kynect was at a music festival, where most 20-somethings care little about anything other than getting their drink on. But a primary component of growing Obamacare is reaching the so-called “Young Invincible” population, those aged 18-34, and convincing them to enroll in health coverage. This population tends to think they are indestructible and often don’t consider health insurance as a priority. This also happens to be the demographic that engages in riskier behavior than other age groups. Young Invincibles often end up breaking a bone, having an illness or getting in an accident that causes them extreme financial hardship or bankruptcy at an early age due to not having health insurance. 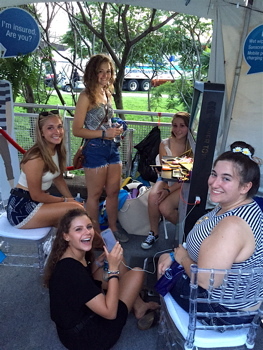 Young Invincibles hanging @ kynect’s All Access Lounge getting their phones recharged. What Obamacare is hoping to achieve is getting the Young Invincibles to enroll in low cost Qualified Health Plans, where this population will pay their premiums, have limited claims and be covered. This will help offset costs associated with other enrollees that have chronic illnesses or older ones that visit the doctor regularly. 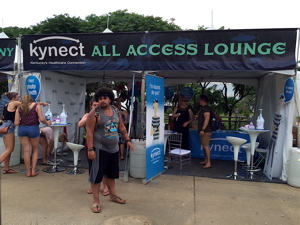 For kynect, Forecastle offered the best bang for its buck. The vast majority of those attending this festival are under 30, employed, and have enough disposable income to afford tickets to such an event. Forecastle also is family-friendly, and by having a presence at the festival it offered kynect exposure to young starter-families, along with the Young Invincibles all in one spot. 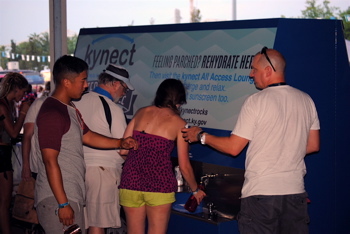 In addition to the All Access Lounge, kynect had two free watering holes, where festival-goers could bring empty water bottles to be refilled. One was located off the Mast Stage area, the other near the Boom Stage. Both were under an overpass to provide shade, and each had long lines throughout the weekend. For me, I was working a five-hour shift each day of the festival, so that earned me a three-day pass. I’m all about checking out some bands. My problem was I had a lingering injury from a 5K race I ran July 4. My right hip was jacked up and I could hardly walk. I went to the chiropractor the Tuesday before Forecastle and again on Thursday just so I could set foot on the property. I was self-medicating with Tylenol, Advil, hydrocodone and tramadol. It was not pleasant, and being that the kynect lounge was over near the WFPK Port Stage on one end of the festival grounds, and the watering holes were quite a distance away by other stages, there was little option but to do considerable walking all weekend. I had planned to go early Friday even though technically I wasn’t working until 8PM. I was hoping to catch St. Paul & The Broken Bones, Jeff The Brotherhood, Fly Golden Eagle and Cold War Kids, but my leg said don’t even try it. I did get to see Cage the Elephant, who originate from Bowling Green, KY. They delivered the highest energy set played all weekend. The Llama working a watering hole. Three of us worked the watering hole by the Boom Stage, which was quite busy, and folks loved the light-up bracelets we were giving away. This thankfully put me in proximity to check out the set from Houndmouth, another local band making national noise. They have a vintage sound and look, and put on a strong show. Light-up bracelets that were sound activated and pulsed to the beat. Ain’t that the truth sister. My buddy I was working with at the watering hole said the look on my face was excruciating. Talk about taking a standing eight count. I was not in good shape and still had a couple hours left to work. This shut me down. All I could focus on was the pain and managing it while standing until my shift was over. Thankfully once the headliner for the night, British crooner Sam Smith, took the stage we closed down both watering holes and the lounge as foot traffic vanished. I slowly limped back to the lounge to change clothes because those of us working late wanted to sit down and relax for a minute with a cold beer. It’s hard to find any alcoholic beverage at Forecastle that isn’t at least $9. We felt no reason to pay $10 for Pabst Blue Ribbon, so we hit the Kentucky Landing, where craft beers were being offered. Sierra Nevada, another Forecastle sponsor, had a special brew, The Close Call Kolsh. We all got one, sat down at an empty picnic table and decompressed after a long day. Another component I would be remiss in not mentioning was the friggin’ heat at this event. The heat index in Louisville was 105 degrees. It was smoking hot all day, and completely overwhelming to anyone forced to be out in the elements. It wasn’t possible to stay hydrated. We all remarked on how much liquids we had consumed and no one had once gone to the bathroom. I’ve never sweated that much without participating in an athletic event. From the moment I set foot on the grounds the sweat was pouring down my body. By the end of the day we were totally drained. Now I’m not a Sam Smith fan. This whole retro-crooner, half Amy Winehouse and half Adele is not up my alley, but while we were sitting there enjoying our $9 beers, his set created a chill backdrop for us to decompress over. The screaming came from the main stage area. You couldn’t really tell what was up at first, and we were too beat to get concerned immediately. A strong breeze, part of some microburst storm came ripping through the trees. I raised an eyebrow as a small ATM machine could be seen blowing down the midway. All these people came running. Too many for the exits to handle at once. Our first thoughts were not to spill any of the $9 beers. 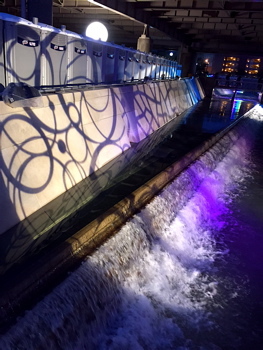 The show was cancelled at the same time as the Louisville River Bats game across the street, and people poured onto River Road and E. Witherspoon Avenue. Meanwhile, as I’m hobbling around hoping the heavens don’t open upon us, my buddy Carlo and I have this kynector who isn’t from Louisville, nor is her ride familiar with the area and is lost in the chaotic traffic, so we’re going the opposite way to get them reunited, which we accomplished. It started pouring just when we hit Carlo’s ride. We chilled for a minute to celebrate the fact that we had reached shelter before the heavens opened, but I was spent. After a brief stop for supplies, that was it for me. It was back to the hotel to begin my recovery. Bringing out the debris from the night’s storm. In the morning I had extremely limited mobility and walked with a pronounced limp. I lurched down to the pool to soak for 30 minutes and tried to get my joints moving. Then soaked another 30 minutes in a hot shower. I got medicated and by 10:30 AM I was on my way to Forecastle. The festival was delayed opening 90 minutes Saturday due to storm damage. The All Access Lounge took some wind debris from the surrounding trees and everything was soaked. We pulled out all the merchandise boxes and cracked them open to dry off anything electronic. I was not looking good. The heat was right back up to the maximum and my pain was of the type that precluded much constructive thought. I was just holding on till 4PM when my shift ended. I did catch Mariachi el Bronx and The Revivalists. Both were hot sets, but I had to leave. The sweat was insane. I also was pacing myself as this would be a long night. I had a ticket to one of the official Forecastle aftershows. The Floozies were playing the Mercury Ballroom at midnight. Upon returning to my hotel at 4:30 PM, the air conditioning felt divine. I reminded Carlo to take his time coming back downtown. More drinks and more meds made the evening look promising. Before finishing our Saturday shift, Carlo and I had scored a set of sponsor wrist bands giving us VIP access, so we returned to Forecastle to take advantage of those around 9:00 PM. Louisville band My Morning Jacket was playing a homecoming show and they were given 2 1/2 hours on Saturday night with the crowd all to themselves. Jim James and company always deliver a show. They sounded great, but I needed higher energy to keep going. Electronica was the ticket. We also were waiting for friends to get done working the late shift. With our sponsor wrist bands we could access the VIP area next to the stage, but getting out of the heat superceded any desire to see MMJ. The true coup was having access to the VIP Lounge. Inside it was air conditioned, there were potted plants with tables and chairs, and we could sit and have a drink in comfort. That was Da Bomb. The Mercury Ballroom was packed but climate controlled. The opener was some questionable rap from ProbCause. The Floozies came out around 1:30 AM with big beats and a splashy light show. Going up into the crowd offered even more energy. The show went till after 3AM. Thankfully Sicilian Pizza on S. 4th Street was open till 4AM. I got one of the last pies and fought my way back through a hungry street crowd to my hotel. You would think I might be in even worse condition come Sunday morning, but that was not the case. I’m not sure if all the dancing kept my hip loose, but my leg was far less of a distraction. I hit Forecastle and could actually focus on getting some decent pictures and posting across kynect’s social media accounts. The heat remained oppressive, but thank goodness it was the final day. 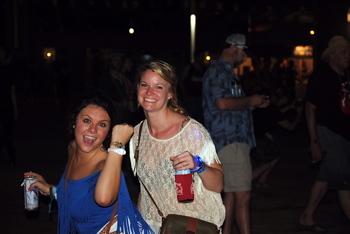 The headliner Sunday evening was Widespread Panic. They are the jam band of record these days. The closest in spirit to the Grateful Dead, and their fans show up religiously. The Panic folks were clearly in the house. Many set up shop off the Mast Stage lawn beneath the overpass. Here they could kill time chatting in the shade for nine hours waiting for JB and the boys, and get their buzz where it needed to be for the evening’s festivities. 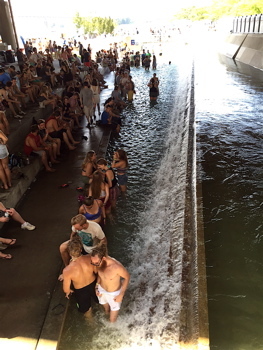 The coolest spot at Forecastle was down in the water out of the sun. The crowds were sparse early Sunday. 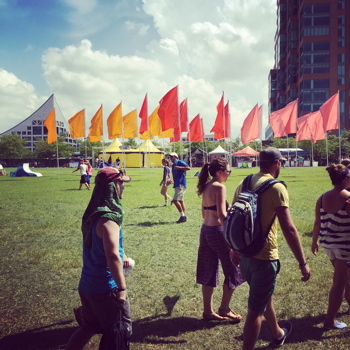 Folks had been out partying late since the official Forecastle kick-off party Thursday night, so people delayed getting back out in the heat until a more hospitable hour, like 2PM. I heard parts of Fat Tony, Twin Limb, Over The Rhine, First Aid Kit and White Reaper, with limited appreciation. Lizzo cranked it up some. Diarrhea Planet delivered one of my favorite sets of the weekend. They rocked the house. As did Portugal. The Man. Great seeing both those bands. With my shift done I changed shirts. Modest Mouse brought their quirky rock stylings to the main stage. RL Grime ignited the Ocean Stage under the overpass, which I appreciated for the energy. One of my top anticipated sets of the weekend was King Tuff on the WFPK Port Stage, and they melted faces. I was trying to hold out for Panic. But I’ve seen them a bunch, and between the heat and fatigue my will was weak. I visited the Kentucky Bourbon Lodge, as I had 15 tickets to use before the end of the day, and hoped for a liquid miracle. Word on the street was not to miss the Old Fashioned cocktail made with Copper & Kings American Brandy. I went with this offering and it was top notch. The Bourbon Lodge, presented by the Kentucky Distillers’ Association, is the liquor headliner. 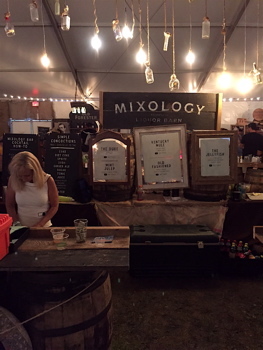 Back for its fourth year, there were 11 distilleries represented, a mixology station, fireside chats with distillers and Feast BBQ supplied the snacks. 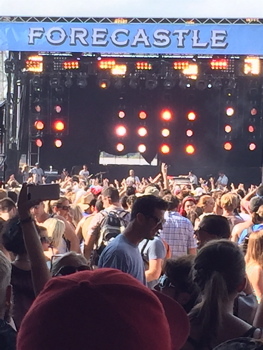 Forecastle did a great job of playing up its local angles and continues to utilize indigenous strengths like bourbon, horses, Louisville and Dr. Gonzo. I wouldn’t categorize Forecastle as remotely Bat Country, but there was The Gonzo Bar, serving as an ode to Hunter S. Thompson. Panic mercifully roared to life at 9PM, opening strong with “Climb To Safety.” It was a fat set filled with several other choice tunes like “Driving Song,” “Chilly Water,” and “I’m Not Alone.” I made it through about half before I called the ball. I didn’t have the spirit to enjoy the rest of the show. I was sorry to miss an outstanding cover of the classic Doors’ tune, “Riders On The Storm,” but I was out of gas. On Sunday, Widespread Panic jammed the night away as the final performer of Forecastle 2015. That was my Forecastle. I would give top billing for the 14th edition of this festival to the heat and weather. Overall, it was a fine festival with over 60 bands playing, but it never went interstellar. This set of bands could only deliver so much energy. Still, the Kentucky bands showed up big and JK McKnight should be proud of what he has built in Louisville. 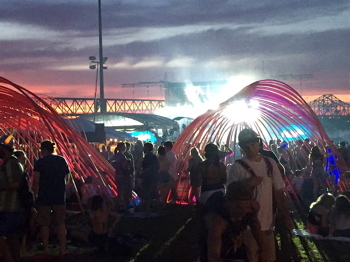 Forecastle drew approximately 60,000 people to Waterfront Park, which is the number McKnight feels can comfortably attend, while still delivering the customer service experience expected. Forecastle is a brand, and McKnight, along with his partners at AC Entertainment in Nashville, continue to grow that brand and make Forecastle a destination event. As an aside, turns out that after a trip to my primary care physician the following Monday and an orthopedist Tuesday, my hip flexor muscle was extremely agitated. A prescription anti-inflammatory, Naproxen (Aleve), combined with hydrocodone cut with acetaminophen, had me on the path to recovery by Thursday. That was some tough outreach in terms of work. The harshest environment I had worked in over two years. Nothing like limping away from a music festival where you are trying to look young in front of a bunch of 20-somethings. Of course I saw more than a couple 20-somethings over the weekend getting carted off on stretchers from heat exhaustion combined with whatever they had consumed. Accidents do happen. This also happened to be my last outreach event for kynect. 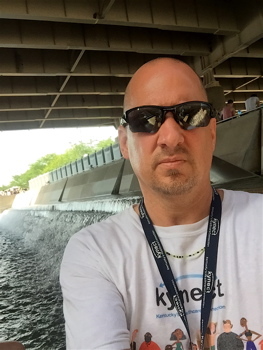 With the upcoming change in political climate that comes with any new governor, combined with the kynect program transitioning from a start-up mentality to a maintenance situation geared for the long haul, it was time to go. I appreciate the opportunity kynect afforded me. I do believe that offering quality, affordable health coverage to those that were excluded this right previously far outweighs the funding questions that may present themselves in the future. Taking care of people should come first. All involved with kynect have done a great service to the Commonwealth in spreading the gospel of the Affordable Care Act, particularly Gov. Steve Beshear and Carrie Banahan, executive director of the Kentucky Health Benefit Exchange. I’m proud of the miles I logged going to faraway counties to help inform citizens about kynect. I spent countless weekends away from my young family since 2013, and have cranked out thousands of posts on Facebook, Twitter and Instagram at all hours of the day and night in support of making this program work. I wish my colleagues at the Kentucky Health Benefit Exchange well, and bid good luck to the various governmental agencies, kynectors and insurance agents that will be working tirelessly during the 2016 Open Enrollment Period, to once again place Kentucky in the vanguard by having one of the lowest uninsured rates across the country. 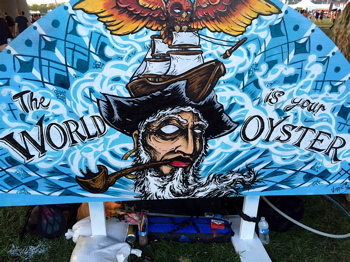 This entry was posted in Events, Food, Liquor, Music, News, Reviews, Travel and tagged Bourbon Lodge, Forecastle, Gonzo Bar, Kentucky Landing, The Kentucky Bourbon Lodge. Bookmark the permalink.